Total War: Warhammer is looking pretty good, judging by the above gameplay footage. It's a meaty 16 minute look at the forthcoming strategy crossover, with developer commentary and fewer dwarf puns than I would have liked. Still, if you want another look at the campaign – specifically the dwarves' role in it – then you'll want to take a look. 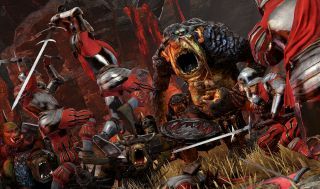 Sega sets the scene in its accompanying blurb: "In the vast tunnels of the Underway, a Dwarfen force lead by High King Thorgrim Grudgebearer is ambushed by a Greenskin horde." The game still has no release dates, but there will be playable demos at EGX 2015.